We’re fans of Cupcake Digital’s interactive storybooks, especially the ones adapted from the hit series Wow! Wow! Wubbzy. They always make us feel warm and fuzzy. So we think it is only appropriate that we feature their latest Wubbzy app, Wubbzy Loves You, on Valentine’s Day. Can Wubbzy and Daizy save Friendship Day in Wubbzy Loves You? It’s Friendship Day in Wuzzleberg, and everyone can’t wait to get their lovey love friendship cards in the mail. But none came! 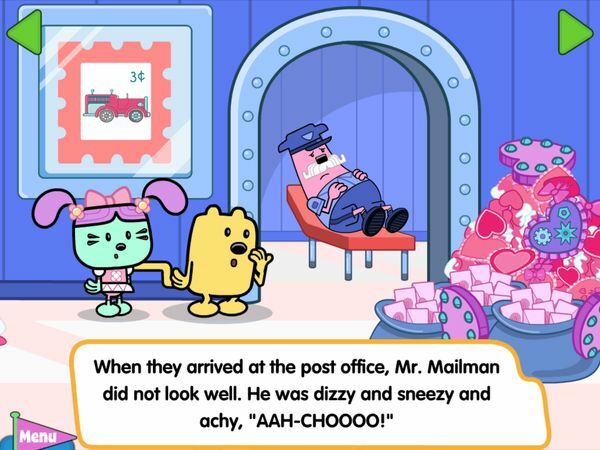 Curious, Daizy and Wubbzy run to the post office, where they find Mr. Mailman unable to work because of a yucky, icky cold. Daizy and Wubbzy are determined to keep Friendship Day going, so they came up with a great idea: they will deliver the heaping piles of friendship cards instead. But can they make their deliveries to all of Wuzzleburg’s kooky residents before the big Friendship Day parade? Wubbzy Loves You comes with three reading modes: Read to Me, Read & Play, and Just a Book. The first two feature plenty of interactions throughout the story, while the third strips down all the extra features for a quiet reading. Love Counting. Kids practice counting with Wubbzy as he blows heart bubbles. Pop the bubbles to count. Love Words. Kids practice spelling while helping Mr. Mailman sort the friendship cards. Drag the envelope to the post box that starts with the same letter. Like other Wubbzy apps, Wubbzy Loves You features a Grown-Up’s Corner. This section suggests topics to discuss with kids post-story to promote critical thinking and encourage reading comprehension. In addition, the app includes a Common Core Corner which details Common Core State Standards implemented in the app. Safety-wise, the app implements security measures to keep little hands from accidentally accessing sections meant for grown-ups. To access links to the developer’s other apps and the parents section, one must first supply their birth year. The app doesn’t contain in-app purchases. Wubbzy Loves You is an adorable and child-friendly story. I like that it touches on a topic very close to a child’s heart: (platonic) love and friendship. Parents with young kids can use the story to discuss what friendship is about and how they can maintain relationships with their friends. Just like other apps from Cupcake Digital, Wubbzy Loves You is rich in interactions to keep juniors engaged. Some of these interactions are educational, for example kids can tap on the Daizy’s clock to move the time by one hour or on the calendar to go through the months in a year. The coloring pages are also a nice touch. I like how they double as Valentine’s Day cards, and I’m sure many kids will be thrilled to send them to their friends and families. Another great release by Cupcake Digital. 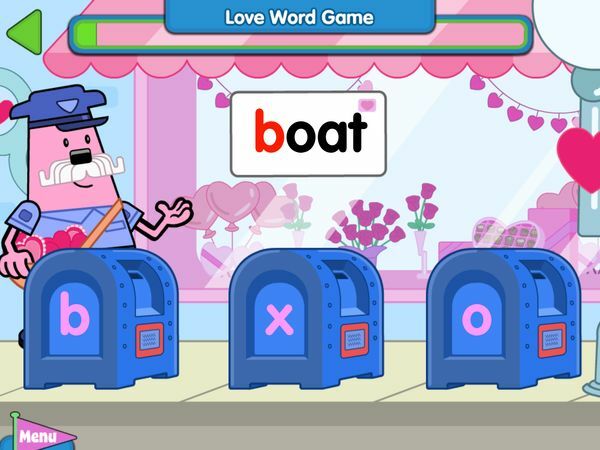 Diehard Wubbzy fans will enjoy coloring in their own Wubbzy-themed V-Day cards, while those who are less familiar with the series can still enjoy the quirky story. All in all, Wubbzy Loves You is an adorable and fun digital book that will surely entertain young kids, whether your family celebrates Valentine’s Day or not.